Sometime in the late seventies, Thai food came into our lives at Thai Villa on, as I recall, Lincoln Avenue. Before that, we’d had lots of Chinese and some Japanese food, but Thai was wonderfully new: ingredients so fresh, flavors bright and clean, the combinations of sweet and sour and heat and salt…unexpected. Farang is a Thai word for someone of European descent. It’s not a slur; it’s more like “gringo”—not a compliment, but neither is it a put-down. At Chicago’s ethnic restaurants, you eat foods you’ve never eaten before, and by doing so, you absorb another country’s culture. 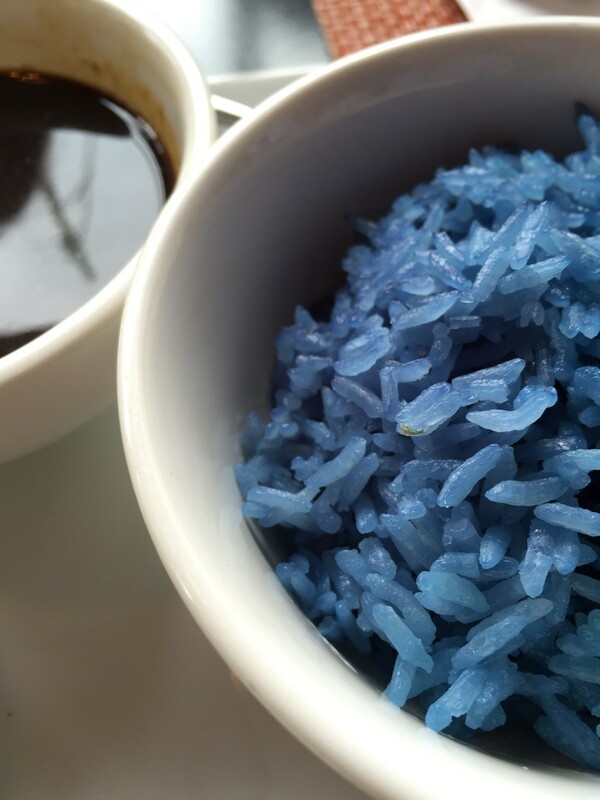 To do the near-total immersion thing at a Thai restaurant, consider following a few simple steps that will help you enjoy the experience as completely as possible and, perhaps, be a little farang. Most Americans expect the world to speak English, and though much of the world actually may, it’s always appreciated when you make the respectful effort to speak a few words of your host’s language. So, when entering a Thai restaurant, bring hands together about chest level, like a praying child, and use the all-purpose Aloha-like hello/goodbye phrase, “Sa Wad Dee Ka,” if you’re female, or “Sa Wad Dee Krub,” if you’re a man (female Thai speakers end sentences with “Ka,” and male Thai speakers end sentences with “Krub”). It will be appreciated, it really will, and it may put you in the right head-space to enjoy your Thai dinner even more. Thai restaurants inventory chopsticks because Americans believe all Asian people eat with chopsticks. The Thai, for the most part, use a spoon and fork or sometimes their hands. I’ve surreptitiously watched people in Thailand eat, and the strategy seems to be to use the spoon to arrange food for the fork to pierce. Now, some Thais use chopsticks selectively: Kanjanawong says she uses chopsticks, but only when eating noodle soup (!). 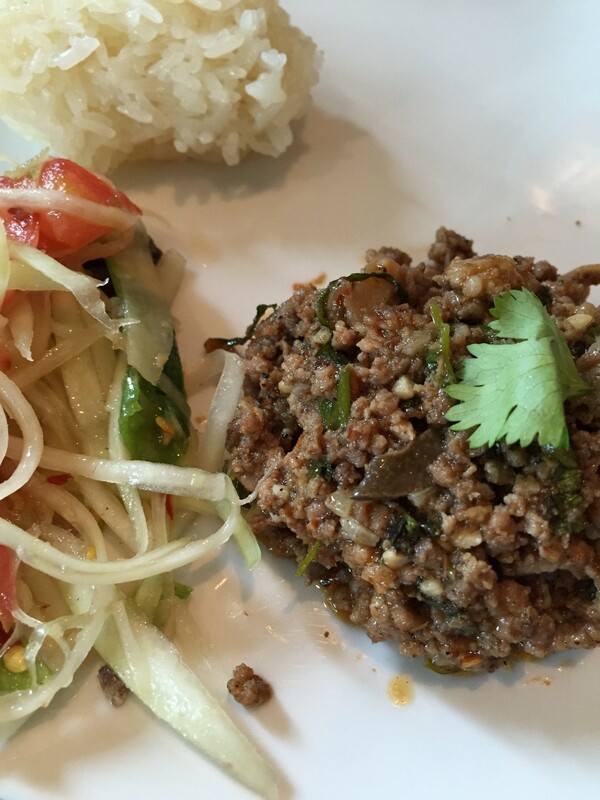 Recently at Aroy Thai (4654 North Damen) I tried to eat larb (a crumbled meat salad) with my fingers; it was challenging. Eating with fingers is hard for us, but you should try it. You do want to be less of a clueless farang, right? We Americans have inherited a tradition of keeping our food items separate, as though each is to be eaten from a compartmentalized TV dinner plate. 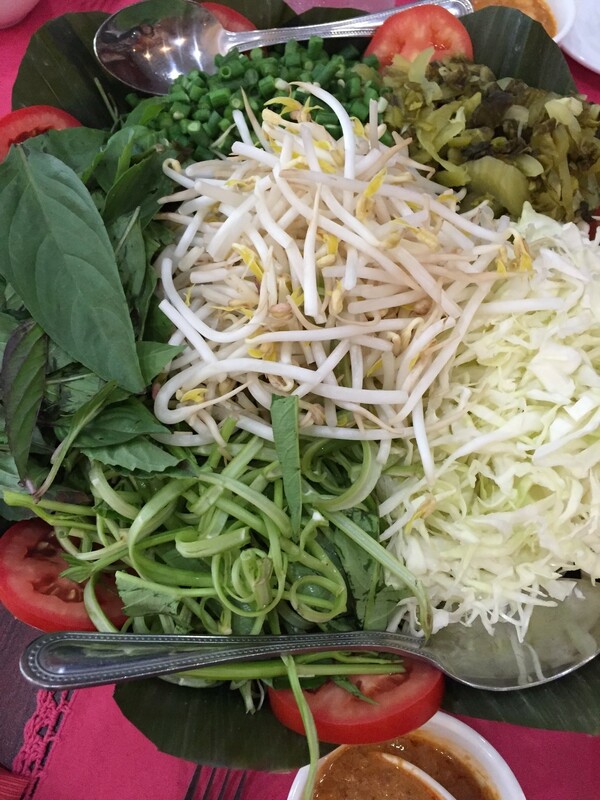 I was eating Mee Krob (crispy stir-fried noodles) at In-On Thai (3821 North Broadway), gingerly plucking little pieces of vegetable—and, um, ginger, bean sprouts, basil leaves—from a big communal bowl of fresh condiments. The Thai-born gentleman next to me did the same, but he was mixing all ingredients. Thai food is a sweet-sour-salty-hot balancing act, and to get all the flavors in equilibrium it’s best to combine them on the plate. Years ago at the now-kaput Thai Grocery on Broadway near Argyle, I’d stand back warily from the tubs of pig’s blood. Never bought any. Now I know better. Blood does add texture and minerality to a broth, and heck, blood sausage is common even among farang, so I got over my hesitancy about eating blood. It’s tasty. Fear not. People hate on pad Thai (stir-fried noodles with veg, protein, peanuts) because it’s supposedly “inauthentic.” Baloney. Though Pad Thai is heavily influenced by Chinese cuisine, it’s very popular in Thailand. “Authenticity” is one of those words you hear thrown around a lot by people who many times don’t know what they’re talking about. Authenticity is no guarantee of goodness, and determining a dish’s authenticity is extremely complicated. Don’t get hung up on whether a Thai dish corresponds to your notion of what’s authentic; just enjoy it, even if it’s different than other preparations of the same dish you’ve had. Eating in the restaurants of other cultures challenges perceptions. Opening your mouth is sometimes a way of opening your mind. 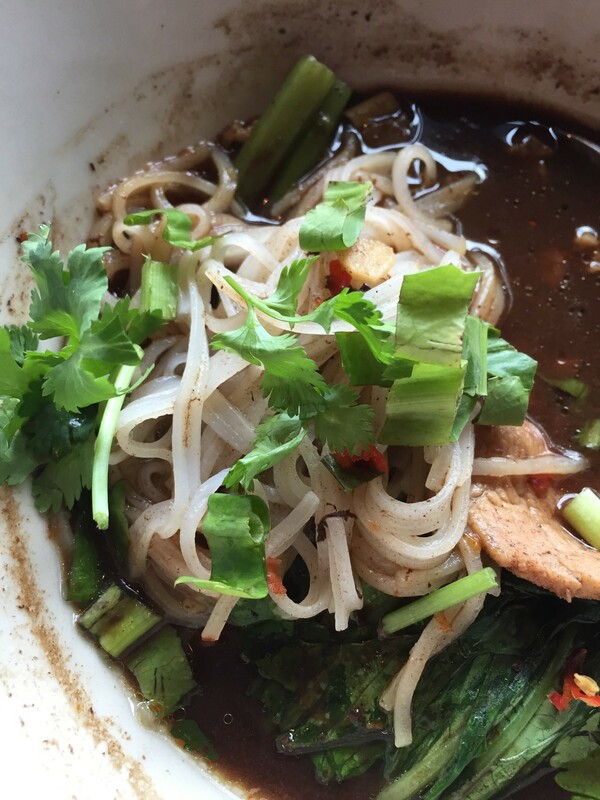 New dimensions of deliciousness could be nestled right there among your pad Thai noodles. Eat.